I wasn’t born in New York, but I feel that New York is the city of my birth. Everything important and life changing that ever happened to me feels like it happened here. Even if I wasn’t here when it happened, I brought it back here where experience moved into result. And there’s something about the iconographic imagery in this city (Times Square, Central Park, Grand Central Station, the Grand Concourse, the 59th Street Bridge) that I always respond to with a mixture of joy and sadness — for New York is both those things — 50/50. 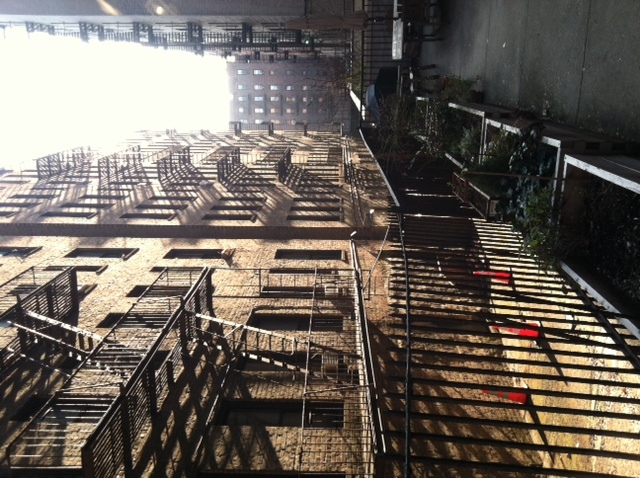 I took this photograph (a view through the courtyard of the building that I live in), because it looks like — for someone who has never been here — proof of something about this city that is timeless. It could have very well been taken 50 years ago. Everything in it — the brick and the steel — is at least that old and it could have been taken the day I am starting the 11th grade at the High School of Music and Art on 135th Street, even though I live even more uptown now. The view from my bedroom window in 11th grade looked a lot like this one and I remember it exactly the same way as far as this particular light is concerned — the sun beginning it’s fall towards dusk. The city is always reminding the native of how it used to look and when something disappears — like the complex of businesses that went up in flames a month ago up on 207th Street — the lapse in the landscape takes longer to get used to than the new building that will probably go up to relieve it. The new Apple store in Grand Central Station, didn’t really relieve anything (the space used to be occupied by a restaurant) and while the designers respected the exisiting space and basically just covered one end of the station with tables and technology, one feels as though the future has blasted a hole through one of the walls of the terminal with the reminder of our own life’s architecture: technology, not a reverie of the past, is where we go now to disappear. You are currently browsing the Places category at Some Portraits and Notes on What I Heard.